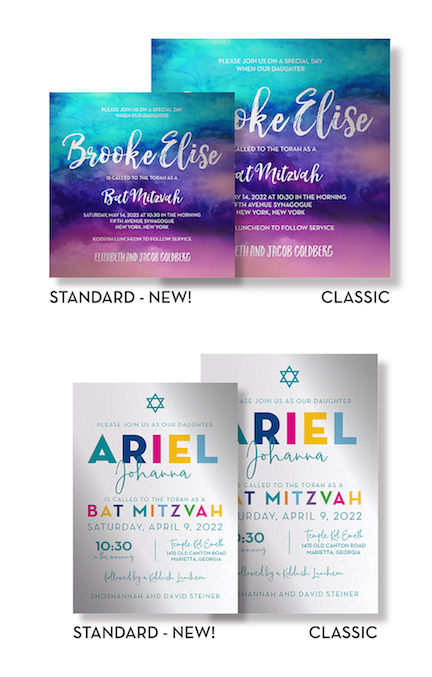 Our invitations are now more affordable than ever! We offer four size options so you can choose the invitation that fits your budget and design preference. Save 20 cents per invitation on printing! Our new standard invitation size includes a square invitation or a rectangle invitation at a slightly smaller size. The square invitation is 5.625" square and fits into a 6" square envelope. The rectangle invitation is 5" x 7" and fits into a 5.25" x 7.25" envelope. Save up to 30 cents per invitation on postage! The square invitation option will also reduce your postage cost by 30 cents per invitation, for a total savings of 50 cents per piece when including printing and postage. Due to the smaller size of the Standard Invitation, a printed backer is not available. Please select our Classic Invitation option if you would like to add a printed backer card. Our most popular invitation size also includes a square invitation or a rectangle invitation at a larger size for a more commanding statement. The square invitation is 7.25" square and fits into a 7.5" square envelope. The rectangle option is 5.375" x 7.875" and fits into a 5.5" x 8" envelope. Why choose our Classic size? The larger size of our Classic Invitation is perfect for adding a printed backer card to double the thickness of your invitations. You may also select from all of our designer paper options.